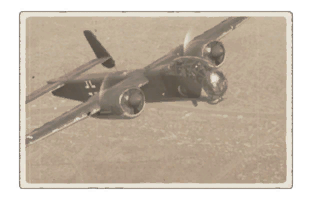 The Ju 288 C is a premium rank IV German bomber with a battle rating of 5.3 (AB/RB/SB). This aircraft was introduced in Update 1.83 "Masters of the Sea". 810 310 ??? ~?? ~? In 1939, the Junkers company began work on a new bomber that was supposed to replace the Ju 88 bombers in service at the time. The new aircraft had to surpass the predecessor across all parameters. The plan was to fit the upcoming model with new, more powerful engines, significantly boost the firepower of the defensive armament, and, of course, increase the payload. The first prototypes took to the skies when the Jumo 222A/B engines, which the aircraft were supposed to be equipped with, had not been installed yet. Instead, the BMW engines were used. Extensive work began on the experimental models of the new series, which received the designation Ju 288, with the aim of enhancing the bomber’s characteristics. This explains why the first eight prototypes were significantly different from one another. In 1942 the Ministry of Aviation made a ruling to include a fourth member in the aircraft crew, which demanded changes to be made to the build of the cockpit. Vehicles of the second-generation prototype series with the letter “B” in their designation had their wingspan increased and their defensive armament changed. The Jumo 222A/B engines still required more work to be done and thus weren’t installed on the Ju 288Bs. The Ju 288Cs, the third-generation prototypes of the series, were fitted with the Daimler Benz DB 605 engines, requiring the nacelles to be changed. Furthermore, the wingspan of the aircraft was increased even more and the defensive armament received another modification – this time, a lower rear turret was added. The Ju 288C’s first test flights began in the spring of 1943. Junkers even prepared three versions of the new bomber build for serial production, each with a unique armament set. However, in June, the engineering department notified the aircraft manufacturer to discontinue work on the Ju 288 due to a lack of resources required to produce the new aircraft. Tests on the Ju 288 continued right up to 1944 – the aircraft even went on a number of combat flights. However, in the end the bomber was never approved for serial production. This page was last edited on 2 April 2019, at 21:23.